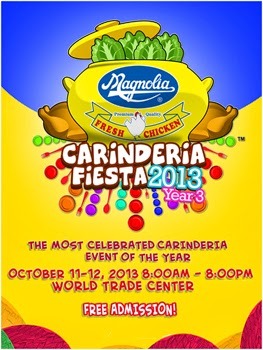 The most celebrated carinderia event is back as Magnolia Chicken once again brings us CARINDERIA FIESTA YEAR 3 (CAFI3)! Happening on October 11 & 12, 2013 at the World Trade Center in Pasay City. Magnolia Chicken Carinderia Fiesta Year 3 comes back with a bigger, better and bolder pakulo that food-loving Pinoys will surely enjoy. This year’s theme, “Buhay Carinderia” gives us a glimpse of the life stories of carinderia owners and how they manage to juggle the everyday challenges of being a business owner and a homemaker at the same time. Magnolia Chicken, one of San Miguel Pure Foods’ brands, has been a passionate supporter of the carinderia segment from the start. Initially planned as a one-time event for carinderias, it has now evolved into an ongoing advocacy of helping carinderia partners uplift their industry and establish a meaningful and sustainable relationship with this segment. 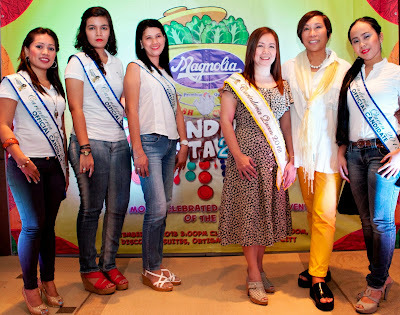 Committed to the Alagang Magnolia promise, this event amplifies Magnolia Chicken’s desire to continue and nurture its partnership with the Carinderias, who have been loyal customers of Magnolia Fresh Chicken over the years. Through Buhay Carinderia, ordinary carinderia owners whose love of food and with simple desires to uplift their family’s lives, share how they have managed to persevere and overcome the obstacles of managing their own business and succeeding in the process. Carinderia Fiesta serves us the biggest get-together of all kinds of carinderias, including small food concessionaires, canteens, food and product suppliers, and entrepreneurs. Now with over 3 million operating nationwide, these humble carinderias are emerging with a whole new confidence in their business by giving more value to observing and complying with standards of quality and food safety, aside from just considering taste. During the Carinderia Fiesta, small-time carinderia owners will be given the opportunity to interact and network with food suppliers, at the same time showcase their family-held, time-honored recipes to a larger audience. Thus, give way to expand their network, open more doors and opportunities to hone their skills, improve their craft, and boost their business potential. Various media companies and food / complimentary product suppliers are participating as CAFI 3 once again promises to take the whole carinderia industry into a whole new level, in effect, changing the way people perceive carinderias. Loading them is Purefoods Star Hotdog, Dari Creme and San Mig Coffee with Nutri – Asia. Negosyo Refrigerator from Condura is once again participating and this time in a big way. Carinderia Fiesta Year III will also hold the search for Carinderia Queen 2013! It is not your typical beauty pageant, as the Carinderia Queen Pageant participants are comprised of carinderia owners who will be given a chance to showcase their talents and their endearing personality. Carinderia Fiesta has truly evolved since its first staging and has become a platform to continually uplift the standard of carinderias, while preserving its true-blue Pinoy essence, where the simplicity of traditional, home-cooked meals combined with its homey and familiar atmosphere take precedence over fleeting food and dining trends. Because at the end of the day, one can never replace the unique character that embodies the heart and soul that is captured in every Pinoy cooking, something which is present in every Carinderia.